In this entry, we’re going to get a little more technical about dental caps and dental crowns. We’ll discuss the different materials that they can be made of. 1) All metal: Gold or stainless steel is the most common materials used for making metal crowns. Even though they’re not used as much as they once were, full gold crowns are usually made for back teeth…though some Rappers would disagree with this. They are strong, but often lacking in esthetics. We use stainless steel crowns quite often on primary (or baby) teeth. 2) Porcelain covering metal: These are crowns that are made up of 2 materials; an outer layer of porcelain that covers an inner layer of metal. The shade of the outer porcelain is matched to that of the neighboring teeth to get the desired esthetics. The underlying metal provides strength to the crown. All metal crowns, particularly gold, are stronger than the ‘porcelain over metal’ type. But porcelain, especially the newer types are quite strong and resilient. 3) All porcelain crowns: Today, many crowns are made of full porcelain. Esthetically they are much better than the porcelain over metal ones. With recent advances in the world of dental materials, very strong dental porcelain materials are available. They are so strong that in some cases they can even be used in the back areas of the mouth where the chewing force can be quite high. 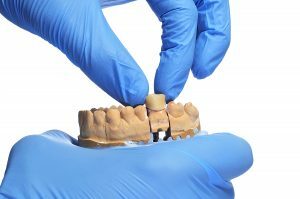 Of the three types of dental crown mentioned, full gold crowns are the strongest and generally last the longest. Porcelain is brittle and is strong in compression, but not tension. 1) Where in the mouth it is to be placed – If it is going to be in the back of the mouth and the person has a very ‘heavy’ bite, we would probably not do a full porcelain crown. 2) Esthetics – On a front tooth, if the person’s bite allows, a full porcelain crown will provide the best esthetics. 3) Finances – Many insurance plans will only cover certain types of dental crowns i.e., they might only cover a porcelain over metal crown on a back tooth and not a full porcelain crown. In the last blog, we discussed what a crown is and why it was necessary. In this blog, we looked at the different materials that a crown can be made of and under varying circumstances, why we may choose to use one material over another. But, why do we even need to place a crown? Stay tuned for the next where we will answer this very question. Dr. Robert Axelrad is a Brampton dentist who owns and manages his own dental practice in Brampton, Ontario. Affectionately known as ‘The Gentle Dentist‘, his patients include children, adults and seniors from Brampton, Bramalea, Mississauga and across the Greater Toronto Area (GTA). Dr. Axelrad recently moved his practice to its current, state-of-the-art dental office at Bestgate Professional Center in in 2002 to accommodate his growing list of happy patients.